I’ve been thinking about my last post, and though I’m happy with what I wrote, I do feel I fell into the trap that most educators get caught in when talking about the value of what they do. We tend to think of the future. We educate students so they can go out into the world and use their education. We hope that they will have productive careers that will benefit themselves and society, so we base our value judgment on the future. The future is very hard to judge because the causal relationship between education and any future success is nearly impossible to prove. Luck plays a role. Drive plays a role. The economy and other bigger forces play roles that affect our students lives as much or more than we can. What we give are tools. Our students, as they go out into the world, are responsible for how they use those tools. So it seems to me that a better place to look for the point to teaching creative writing (or at least an equally valid place to look) is in the present. Teaching creative writing in a university setting has value because the work that students produce while they study creative writing has value. When we go to see a performance of a college play, we don’t ask how many of the cast will ever end up on Broadway or in Hollywood. (Or at least I sincerely hope we don’t!) We applaud the students for their effort, which often has resulted in very good performances. Could all those students survive and present equally good performances every night, given the rigors of professional acting? Probably not. Will all of those students have the drive and good fortune to be successful in a drama career? Probably not. Yet they have come together to create a performance that moved an audience. They have bonded together as a cast to create a work of art. The same could be said of a musical performance or of a gallery exhibition. So why do we hear this argument so infrequently in relation to undergraduate (or graduate) creative writing? 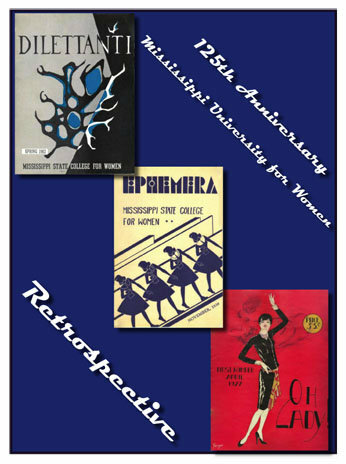 Last year, my colleague Bridget Pieschel and I worked together to put out a retrospective issue of the Dilettanti student literary magazine for Mississippi University for Women’s 125th anniversary. As we went back through the past issues (including previous incarnations of the magazine as Ephemera and Oh Lady! ), we found many pieces of merit — more than we could use — including, of course, some the early writings of Eudora Welty. Yet there were many other writers within those covers who never went on to fame. Their work was equally inspiring, perhaps more inspiring because it was not overshadowed by later, greater works. A student literary magazine is a great document of the history of a writing program, of course, but it is not the only thing we produce. Every final portfolio has merit and is a milestone for the student. In producing a magazine, taking part in a writing club, organizing a reading or a conference, or taking part in a workshop, students build a community of writers. With any public performance or publication, students add to the community experience of their university. Though these community building skills will serve them well in the future, the value of those activities is felt in the present as well. In other words, when a student comes to me and says she wants to be a writer, my job is to help her become a better writer now. I hope that the seeds I plant will take root and will help her later in life, whether or not she does become a professional writer. Yet even if the only value she gets out of her education is what she accomplishes that semester or in the four years in our program, that experience ought to be valued. Education, especially for creative writers, is not just about what we will become, but it is about who we are and what we produce today.